This dynamic foursome has been electrifying audiences around the world for over 25 years. 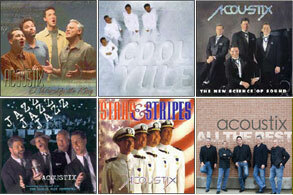 ACOUSTIX has appeared on CNN, NBC’s “Today Show,” TNN’s “The Statler Brothers Show,” and two PBS specials. At the turn of the 21st century, ACOUSTIX performed for a global audience of 175 million viewers on “ABC 2000,” hosted by Peter Jennings. Email us at bookings@acoustix.com or call 214-533-5419.